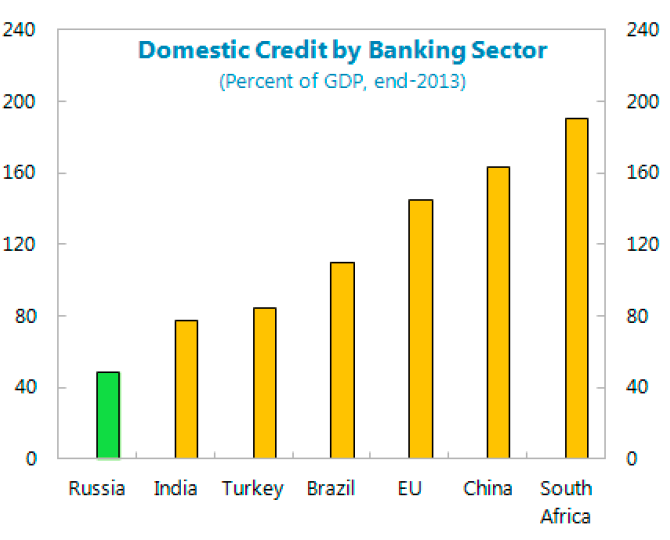 Alongside the Article IV (covered in three posts all linked here: http://trueeconomics.blogspot.it/2015/08/3815-imf-on-russian-economy-private.html), the IMF also released a series of technical papers, including one on the state of health of the Russian financial markets. Top-level conclusion: "using a comprehensive index of financial development, to identify potential bottlenecks", the study "…finds that Russia’s financial markets are relatively deep, accessible and efficient, but that financial institutions, in particular banks, have much to do to improve their efficiency and create further depth. Russia could potentially gain up to 1 percentage point in GDP growth on average over the medium-term from further deepening and efficiency improvements. 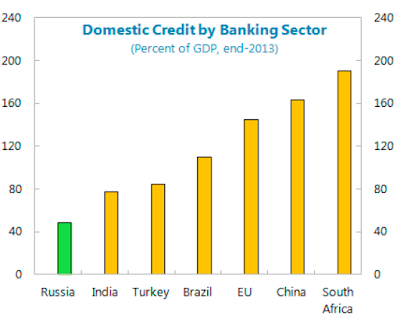 Policies towards this outcome include reducing banking sector fragmentation through consolidation via increased supervision and tightening capital standards; strengthening the role of credit bureaus and collateral registries to reduce information asymmetries; and removal of interest rate rigidities to foster competition." 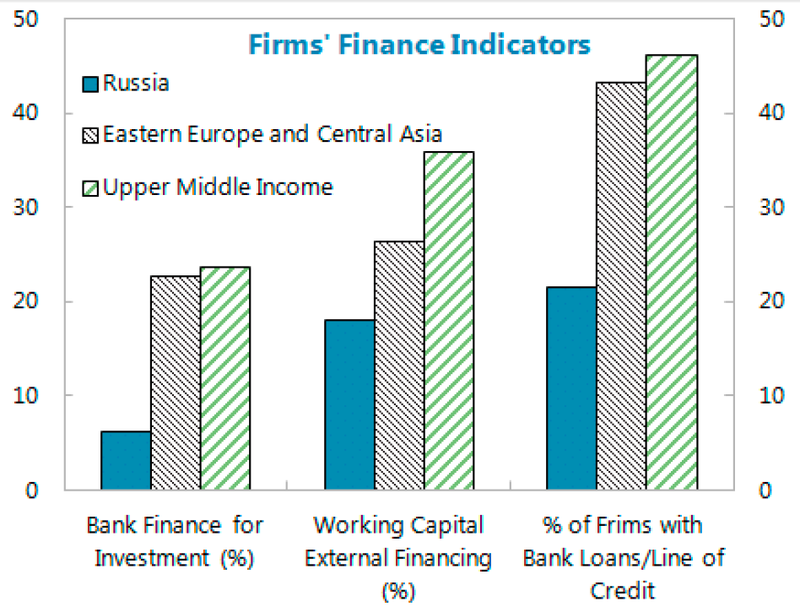 Specifically, one key bottleneck is the distribution of sources for finance: "Russian companies rely much less on external financing in general and on bank financing in particular, to finance investment compared to their peers in Eastern Europe and Central Asia or in their upper middle income group. Typically, internal resources, state funds and controlling entities are responsible for financing up to 80 percent of business investment. As a result, banks contribute only 6 percent of funding for business investment, with the bulk of investment financed from retained earnings." Low debt levels also allow for absorption of political shocks that we are witness gin today, arising from political shutting down of Russian companies access to Western funding markets. If Russia is to retain meaningful risk buffers, accessing external finance via bond markets and equity markets abroad saddles Russian entities with higher risk of external shocks. So IMF can propose, but I seriously doubt Russian companies will be rushing to borrow at a breakneck speed any time soon. Efficiency (ability of institutions to provide financial services at low cost and with sustainable revenues, and the level of activity of capital markets)." So IMF main conclusion is quite surprising for those not familiar with Russian markets: "Russia’s financial markets are relatively developed but financial institutions lag behind in terms of efficiency and depth." 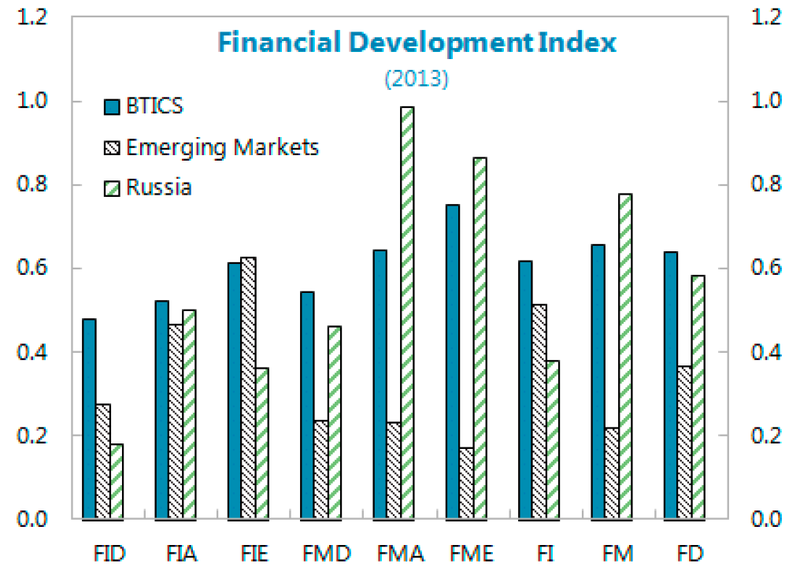 "Russia’s FD index (0.58) is higher than the average EM (0.37) and slightly lower than the average BTICS (0.64), a group of countries composed of Brazil, Turkey, India, China, and South Africa. 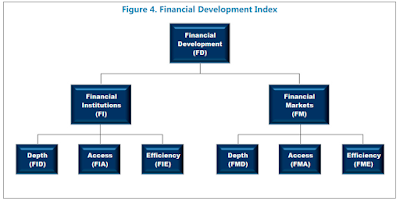 …Russia scores much higher than the comparator groups for FM developments [Financial Markets development] as it features higher degrees of access and efficiency in the operations of its financial markets. 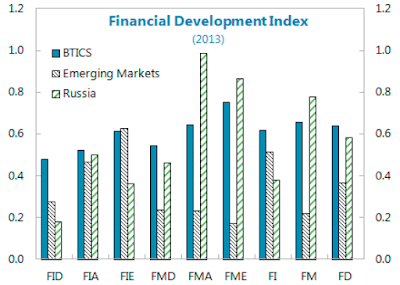 Although the depth of financial markets is slightly lower than BTICS countries, it remains much higher than the average EM." 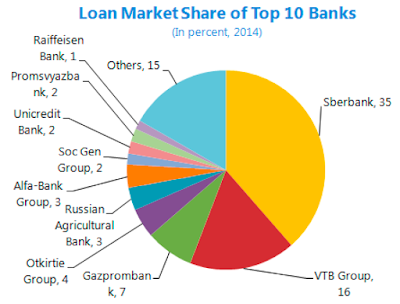 Big bottleneck is in financial depth, where "…financial institutions in Russia are comparatively dominated by the banking system, with fewer to non-existent assets, in percent of GDP, in pension funds, mutual funds and insurance industry. Moreover, the banking system lacks depth with domestic credit at about 50 percent of GDP being the lowest in the BTICS group." 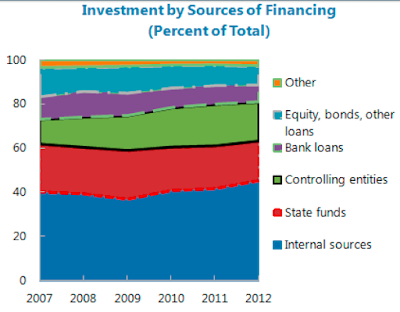 "The top three banks (state-owned) accounted for more than 50 percent of total sector assets at year-end 2014 while the top 20 banks accounted for 75 percent of total sector assets." "Lending is highly concentrated among the top 10 bank groups making about 850 banks contribute only 15 percent of total lending." "…VTB Group alone with 16 percent share of lending accounts for a similar share as the 830 remaining banks." "Most of the banks are small and act as treasury accounts for local firms, operating in particular in mono-cities." This "…undermines lending to companies and SMEs as their ability to both extend credit and diversify across companies is limited while lending to consumers is usually the dominant form of credit." What is there to be done to get Russian banking and financial systems up to speed? Cut the number of banks without impacting degree of competition. Which is easy to say, hard to achieve, and at any rate, Russian authorities have been doing as much, albeit slowly, for a good part of almost 2 years now. Increase supervisory pressures to remove even more banks out of the active list (again, has been ongoing since 2013). Improve quality of collateral registries to lower the cost of collateralisation for SMEs. Which, in part, will also involve improving existent system of credit bureaus. Link deposit rates paid by the banks to the banks' deposit insurance cover. In other words, remove Central Bank restriction on deposit rates quoted by the banks, but replace it with a restriction capping ability of highly risky banks to raise uninsured deposits. Which sounds like a good idea, assuming deposit insurance scheme is fully funded and solvent. Which, in turn, assumes no systemic crisis. Privatise state banks. Which is strange. IMF also notes that "there is no urgent need in Russia for large scale privatization, especially in light of the fragmentary evidence that public banks in Russia are not less efficient than private ones." And the Fund stresses the importance of economies of scale in delivering improved banking sector efficiencies. Which begs a question: what is to be privatised? Large state-owned banks? If they are privatised with a break up, the system will suffer risks to the efficiency. If they are privatised as they are, the system will receive private dominant players in the market which, arguably, will be no different from the state-owned ones in any meaningful way.